So, you need to sell your house. Selling your house in a market like today’s can sometimes be frustrating. With so many other houses on the market it gives buyers out there more choices… and often times sellers can wait 3, 6, 12+ months to sell their house for a price they feel is fair. This brief, 3-part article will walk you through the process to help you decide what’s best for you. Should you go the traditional route and work with a real estate agent, sell it yourself (For Sale By Owner), or work with a local house buying company? Each of these strategies has different pros and cons and each one will help you reach a different goal. It’s for you to really look and see what you need to accomplish with the sale of your house… then make the decision that helps you get there. 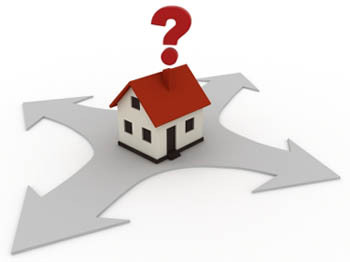 You contact an agent and they consult with you about your house to determine what they feel it may sell for. You sign a listing agreement with the agent (normally 6-12 months) where they exclusively represent and sell your property. Agent lists property on the MLS, markets it, and allows buyers to walk through your house for showings (a house should show well to sell well). Selling agent fees are usually about 3% of the total purchase price. The “buyers” agent usually earns 3% as well (totaling 6% in agent fees). As an example, if your house sells for $200,000… you could expect approx. $12,000 of that to be paid to the agents at closing. Agents know the market well, have access to the MLS to list your house to expose it to a broad range of retail buyers, they’ll take care of the marketing, showing of the property, and putting together the closing documents. It can be expensive. An agent’s commission is paid out of the proceeds of the sale at closing. Most agents tend to do “traditional” marketing which often takes 3-12 months to sell a house (in most markets the average time on “market” when listed with an agent is 6+ months currently). This of course means you’re responsible for the costs of the house while it’s trying to sell. Lastly, with agents… their primary way to get buyers is by focusing on “retail” buyers (people looking to live in the home). This requires showings of the house and there’s always the chance that the buyer who’s offer you accept has their financing fall through, or delay the closing date. One last “con” is that many retail buyers will ask you as the seller to pay for part of the closing costs… so this is an additional expense in many transactions. People who aren’t on a time crunch and can wait 6-12 months if they had to, to sell, have room in the transaction to pay the agent fees, are looking for full market value and are willing to wait it out until a buyer comes along who is willing to pay full market value.